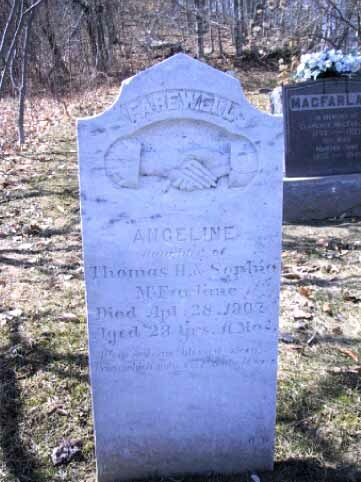 Angeline MacFarlane (was buried age 23 yrs. 11 mos.) in her Wedding Dress. Injured her lung while swing in the barn in the spring of the year. Was to marry Fred Mooers, who subsequently married my grandmother, Ada Blanch Mooers. Clarence MacFarlane (brother of Ada B. Mooers) on right in the background. Thomas & Sophia MacFarlane. Hence the old MacFarlane Place. Gram Always said I Looked Like the MacFarlane's; I guess I did, in my youth. This is Angeline MacFarlane, Gram's Sister! Asleep in Jesus, Blessed Sleep. From which none will wake to weep.